THE 3500 YEAR OLD 118 FOOT TALL BALD CYPRESS ‘THE SENATOR’ IS REDUCED TO A 20 FOOT STUMP IN A MATTER OF HOURS. We are saddened to hear of the loss of this magnificent tree. First we heard it could have been arson, but then investigators found the fire started high up in the 118 foot tree. Possibly lightning that struck the tree and smoldered, and then burst into flames. The drought conditions in central Florida make this a plausible enough scenario. We will have to wait for a full investigation to be completed before we know all of the facts. 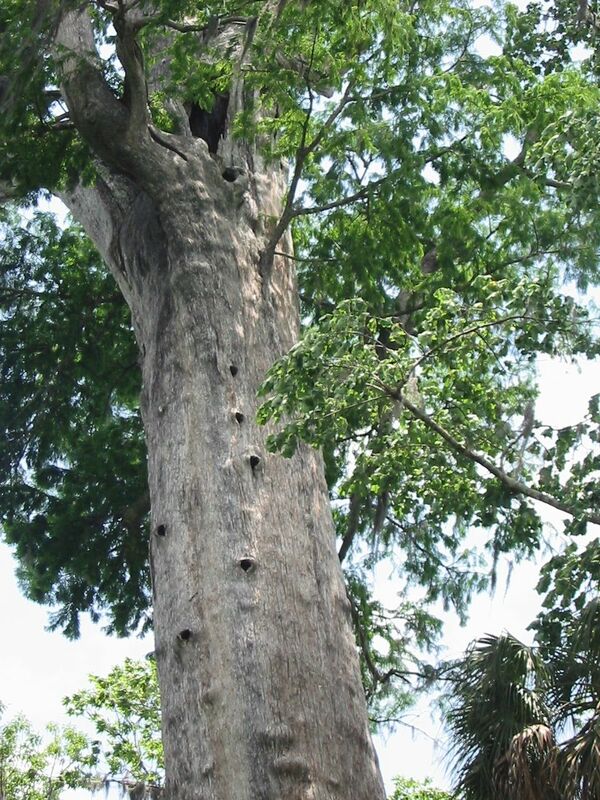 This Bald Cypress was the biggest and the oldest native tree in Florida and of its kind. For many Central Floridians, this tree has remained a constant; the most consistent natural feature of a dramatically changed landscape. Since Senator Moses Overstreet dedicated the land around the tree as a park in 1927, the area has become developed and urbanized. We visited “The Senator” in Big Tree Park, north of Orlando in 2008, and seeing this place has been instrumental in our ability to visualize and begin to comprehend what the old Florida must have looked like. Seeing this 3500 year old Pond cypress really put it in perspective for us. To stand before a living being that was alive in 1500 B.C. is really astounding. The grand stature of the tree, its width and height, added to the experience. If something is going to be 3,500 years old, we would expect it to be big and memorable. Upon hearing of the news, we are unsettled to know that we saw this tree in the very last days of its life and were unaware of any impending doom. It is also sad to know that others after us will not get the same experience, now that the tree is gone. The good news is that there is a much younger ‘sister’ tree in Big Tree Park, , the 2000 year young Lady Liberty. In the bigger picture, what happened this morning will be examined and analyzed. How natural of a cause was this? If it was totally natural, so be it, we just witnessed nature at work. If not, and it could be some time before we have an idea about this, this could be disturbing news. What if it is not natural? Why now after such a long life? Do we have evidence of 3500 year old trees that died 100 years ago? 200 years ago? 50 years ago? How long before Lady Liberty suddenly burns down in two hours?